According to the dictionary Fantasia is a musical work not composed in a strict form or a mixture of popular tunes arranged as a continuous whole. My Fantasia features toe tapping diva dance loosely spiralling (no strict form) with a mixture of popular tangles arranged to make a whole piece of Zentangle Inspired Art. I really appreciate all the beautiful comments that I receive so this week, as it was my birthday, I would like to give Fantasia as a happy birthday present to one of you. Just leave a comment and keep watch, next week I will announce the winner. Yay!! Oh how sweet it would be to have this!! Hope you had a wonderful birthday!! Happy Birthday - This piece looks like a party I would love to go to! First an foremost I hope you had a wonderful birthday!! I so love your artwork this piece is awesome and I would be love to have it hanging on my wall! I would like to know one of your secrets on how you take pictures of your Zentangles I need to take a pic of one of mine and things are not working out so well. I find the best way is to use a scanner, it's easy. Cheers! Happy birthday and thank you for another stunning ZIA. Hope your birthday was awesome. Your art work is so inspirational - My fingers are crossed I will win. Your site and art work was one of the first ones I explored when I learned about zentangle, so it would be an honor to own one of your pieces. Happy birthday week to you, Michelle! I like this piece; it has within in many of your go-to tangles! And just a bit of color to play with when choosing a mat to frame it with!!! That is, if the planets align in my favor. You do such beautiful work. Happy Birthday! Michele, happy birthday! Your piece brings to mind a wonderful party - under the sea! The sun shining patterns on the surface above them, clean clear sand below - tentacles wafting sensuously, sinuously to the sounds of the music of whales! I have found myself turning, even more frequently than usual, to the blogs of certain tanglers, yours being one of them. My daughter is undergoing chemo at the moment and creating tiles has become a relief for me. By studying the style of certain artists, I try to make my untutored hand move in new ways. I was meant to be packing for a trip to Sydney (from CT USA) to see Mum, my brother and sister right now, but Kristen's chemo (and recovery - hope, hope, hope) comes first. Mum has promised me a trip to Tasmania when I can get over - I am hoping that you have classes, or will give me a private lesson when I'm there, cos making my hand move the way you can, isn't going too well right now!!! Still, I have my own style, and i am learning to tell myself that I can no longer say "oh, I'm not an artist" and I am learning to be proud of my accomplishments! It would be lovely to take care of this piece of yours - a joy to look at, and an inspiration for my slowly unfurling, newly found creative side. I am thrilled to know we are both Pisces! What a beautiful piece. 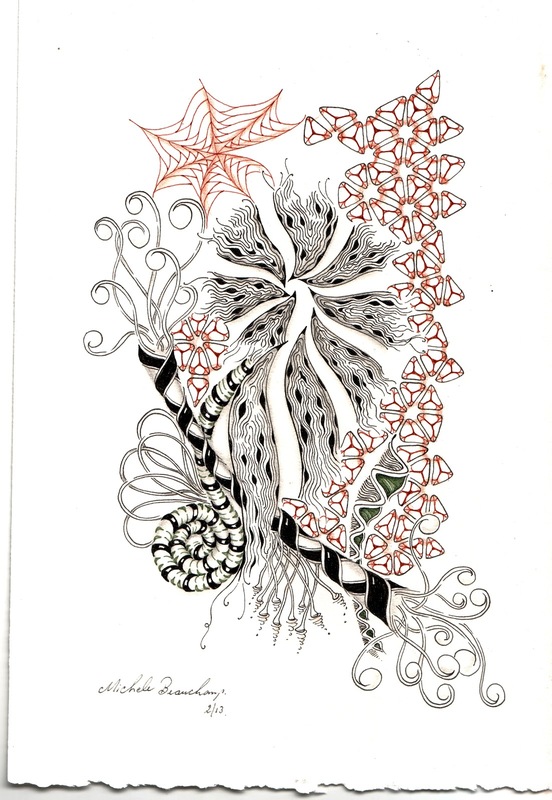 You have really found your match in Zentangle! Happy You Day.....that so very much for the opportunity to win one of your extraordinary pieces..
Shelly, I don't comment here nearly enough, for which I apologize! Your creations are always stunningly beautiful & so very inspiring - thank you for sharing your art with us! I would be honored to own one of your pieces of tangled art!!! This would look fabulous hanging in my house. These are my colors. Thanks for sharing all your beautiful tangles with us. Happy Birthday Michelle.........spin the joy out all year! I have admired you and your work in the year since I started tangling. Still can't master the spiral, but I guess that will happen when it is meant to ! I wish I could give YOU a birthday gift as wonderful as the gifts you share with us. Happy Belated Birthday Michele. Thank you for showing us all your ZIA. You are a wonderful inspiration to many of us. It would be wonderful to have your ZIA in real life in this part of the world. beautiful work, michelle, i love it! i am glad you had a wonderful birthday! i already have a couple of your artworks, but i wanted to tell you it's beautiful! As usual your work of art is truly stunning - I could look and get lost in it for hours. I think this must be a true Zen experience. Thank you for sharing your work. Love it a fantastical Fantasia. Happy Birthday. Happy belated birthday, have only been tangling since seeing your work in the Upper Piper Arts & Crafts Co-op in Lilydale. You're works is so finely detailed and inspiring. I'd be honoured to have apiece of yours hanging in my home. Hope to have a lesson with you later this year. Thanks so much for sharing your talent not only here in Tasmania, but worldwide. Lilydale is a beautiful spot, it would be lovely to catch up! I hope your birthday was extra special! I love your ZIA and would love to win this beauty. Thank you! Happy, happy birthday to you! I love following your blog to see all of your beautiful ZIA's. Happy birthday!!! Hope you have a wonderful year. Thank you for sharing your beautiful works of art, I have been following your blog for a very long time and enjoy it so much. Would love to give a good home to a piece of your art. Your work is so beautiful and inspiring Michele! Someone is going to be very, very thrilled to receive such a wonderful gift! Hi Michele. I am loving your work. I would dearly love and appreciate having a piece of your art. Happy Birthday, Michelle!! Your "Fantasia" is lovely. Would love to hang it next to your other ZIA! Happy Birthday Michelle, What a wonderful, fanciful Fantasia you've created. Have a fabulous birthday week! Another gorgeous peice! Love your flowy, organic style.